I absolutely love to plan. If I don't write things down, they simply don't happen. I love having a planner around, but I never found one that was perfect for me. I love Well Planned Day, but I needed a bit more for my daily goals. 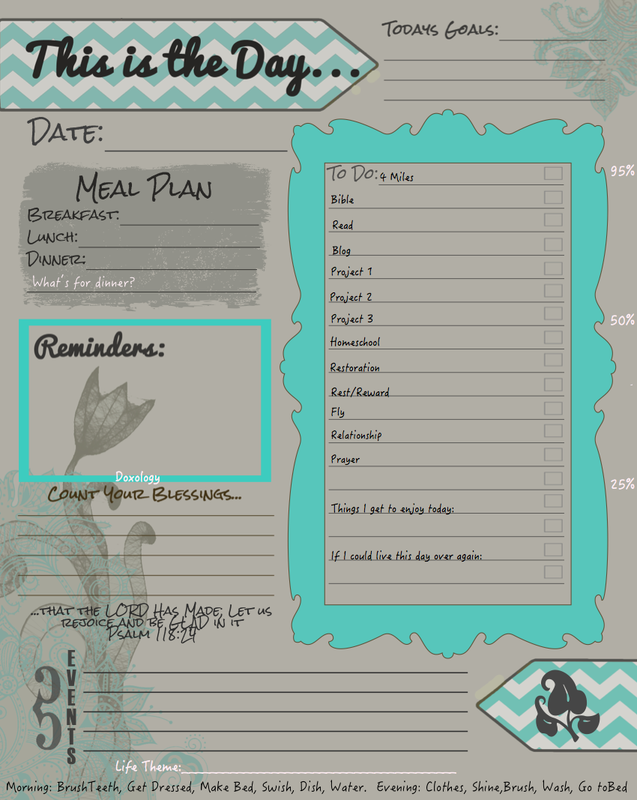 I also enjoyed Donald Miller's productivity planner, but as a mom I needed more. The same with Ann Voskamp's. Recently, I downloaded this from Etsy and customized it to fit the things I like. On Donald Miller's productivity plan, he has a cloud on the side that goes down in percent through the day. It is a reminder that we need to do the work that needs the most concentration first. He also had a line for rest and reward for accomplished goals! I don't really do that for myself. I keep going until I pass out (except Sunday afternoon. I love Sabbath!) He also had a line for Life Theme. What a great way to stay on track. From his, I also took the Projects. They are limited to three. Can I get an Amen? The questions about what we get to enjoy and what we would change also came from him. If you are not running a household from your planner, I would say his would be great. On Ann Voskamp's planner, she had a space for a relationship she wanted to invest in that day. I thought that was wonderful. Even if it is just prayer or a short message. To spread the love of Christ is a beautiful reminder. I also added a fly line so I can write what zone I am in. That is from Flylady. I listed her morning and evening routines across the bottom just as a reminder. Sometimes with three children underfoot, I can forget everything. My favorite is the area where you count your blessings. It's a daily Doxology. Praise to our God. I delight in the fact that Thanksgiving can tune the heart to sing His grace. I use Cozi online to keep up with my calendar and art for sale. You can print and bind this for about what you pay for a planner. You can also stick it in a frame and use it as a dry erase board. Thanks so much for sharing this on your blog! I love how you customized it to fit your needs and daily routines! I noticed traffic coming in to my shop from your site, so had to check it out! So glad I did! I would be happy to work with you or your readers anytime!